In the previous article, I discussed how to use F# asynchronous work­flows for creating reactive user-interfaces. One of the main concerns was to avoid blocking the GUI thread (to prevent the user-interface from freezing). The workflow shouldn't perform any CPU-intensive compu­tation when running on the GUI thread. The standard F# library provides two ways to run a computation on a background thread from an asynchronous workflow. The StartChild operation starts an operation in the thread pool and returns a workflow that can be called using asynchronous (non-blocking) let! construct. The SwitchToThreadPool operation can be called using do! and resumes the rest of the workflow on a background thread. When using the SwitchToThreadPool operation, we also need to eventually use SwitchToContext to transfer the execution back to the GUI thread (after completing the CPU-intensive calculations). In this article, I describe a variation of F# asynchronous workflows that keeps track of the running thread in the type of the computation. As a result, calling a workflow that should be executed on a GUI thread from a background thread is a compile-time error as opposed to failing at runtime. The easiest way to implement checked asynchronous workflows is to just wrap the standard F# implementation and add type parameters for keeping the additional information. Then we also need to create a wrapper for a computation builder that will correctly propagate the additional information. Let's first look at the type declarations and then explore some examples. The definition of computation builder is briefly discussed at the end of the article. 3: /// produces a value of type 'Value. The last type parameter of CheckedAsync is the type of the value produced by the asynchronous workflow and is uses as an argument to the wrapped Async. The two additional parameters are called phantom type parameters, because they do not appear anywhere in the definition. In many ways, they are similar to units of measure - they just add additional information to the type that is checked at compile-time. The next two types can be used in place of the first two type parameters. For example, a computation of type CheckedAsync<GuiThread, BackgroundThread, string> represents an asynchronous computation that starts on the GUI thread (where it can access user-interface elements), then switches to the background thread (which can be done using SwitchToThreadPool), then performs some CPU-intensive computation and produces a string value. When called using let! from another asynchronous workflow, it resumes the rest of the workflow on the background thread (which is quite subtle behavior - most of the standard asynchronous operations resume on the same thread where they started). 2: /// computation that should not block the user-interface. 11: /// access user interface and should run on GUI thread. The functions are declared almost like ordinary asynchronous workflow. The only difference is that the snippet uses a parameterized computation builder asyncOn. The argument specifies the thread where the computation should start (the values gui and background are just dummy values to specify the type using a nice syntax). The F# compiler infers the thread where the computation will complete from the initial thread and from the code of the workflow. Both of the functions are quite simple and they do not change the thread where the workflow is running. As a result the type of the first workflow is CheckedAsync<BackgroundThread, BackgroundThread, float> and the type of the second one is CheckedAsync<GuiThread, GuiThread, unit>. 4:   // ...but cannot continue on the GUI thread! As the snippet shows, the code doesn't compile. 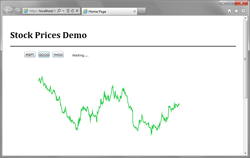 The problem is that the workflow created by extractStockPrices ends on the background thread, but the workflow created by displayChart can be only started on the GUI thread. The definition of Bind in the computation builder (discussed below) specifies that the end-thread of the first operation must match the begin-thread of the second operation, which is not the case in this snippet. Also note that the F# type inference correctly deduced that the entire wrongWorkflow starts on the background thread, because this is where the first operation starts. This also follows from the definition of the computation builder. With the additional thread transition in the middle, the snippet now type-checks and it creates a workflow that starts on the background thread, does some work, switches to the GUI thread and then displays the chart and returns. You can verify that by looking at the (inferred) type of the goodWorkflow function. The types of operations now also carry the specification of threading behavior. The AwaitObservable operation can be used only on the GUI thread and it resumes the workflow on the GUI thread. This works for standard F# events, but other sources of IObservable<'T> may behave differently (the right solution would be to use a more expressive type IObservable<'Thread, 'T> with 'Thread describing where events are triggered). The StartImmediate operation starts a workflow on the current thread. It is expected to be used on the main thread (outside of asynchronous workflows), so the type specifies that the argument will be executed on the GUI thread. The operation doesn't care where the workflow completes, so it uses a type variable 'Post. The AsyncDownloadString operation is implemented such that it returns back to the original thread where it was started. This is behavior used by most of the standard F# asynchronous operations and is captured by the fact that the same type variable ('T) is used for both starting and finishing thread. Now that we've seen numerous primitive asynchronous operations, let's look how to fix the above example. The following two sections implement the two approaches introduced in the previous article. We start with switching of the current thread and then look at starting computation as a child. Before we can call the extractStockPrices function, we need to switch the execution of the workflow to a back­ground thread. This is done simply using SwitchToThreadPool which resumes the workflow on a thread from the thread pool. To switch back, we use SwitchToContext, which resumes the workflow on a thread represented by the SynchronizationContext used as an argument. This may be either a GUI or a background thread - to make this type-safe, we need to keep track of the thread in the type of synchronization context too, so we use a wrapper Synchronization­Context<'Thread>. The type parameter 'Thread represents the thread captured by the context. The CurrentContext method creates a workflow that starts on a thread 'T, ends on a thread 'T and returns a synchronization context representing the same thread 'T. When used in the snippet above, the operation is called from the GUI thread and so the type of ctx is Synchronization­Context<GuiThread>. The SwitchToContext operation takes a typed synchronization context representing a thread 'T and creates an asynchronous workflow that resumes on a thread specified by the context. In the above example, the operation switches the execution to a GUI thread (stored previously), so that we can call the displayChart function. The use of generic types when working with synchronization contexts demonstrated one of the fascinating things about programming in F# that is carried over to checking of threads in asynchronous workflows. We can easily write polymorphic code that works with any values and executes on any threads while still checking that computations are composed correctly. With a bit of effort, it is even possible to capture dynamic behavior introduced by synchro­nization contexts. As already explained, the argument should be a workflow that can be started on the background thread and we don't care where it completes. The result of the operation is a checked asynchronous workflow (that waits for the completion) wrapped in another checked asynchronous operation (that starts the task). These two operations use two different type parameters to track the thread, because it is perfectly possible to use them from different threads. For example, we may start the background operation on a GUI thread and then pass the result to some other workflow that will wait on another background thread (in which case 'Pre1 would be GuiThread and 'Pre2 would be BackgroundThread). The key idea of the approach demonstrated in this article is to extend the type of asynchronous workflows to also include two type parameters that do not appear in the type definition (these are called phantom types). The additional type parameters specify threads where the workflow starts and where it completes. Then we need to annotate standard async operations with the additional types to specify the behavior. I demonstrated type signatures of several of the operations of the CheckedAsync type earlier in the article. The implementation can be found in the source code, but is mostly trivial - just wrap the operation from standard F# async and add types. The last important piece is to specify how the operations compose. When you run one operation and then some other operation, the resulting thread of the first one must match the starting thread of the second one. This rule is also used by the F# compiler to infer the types of operations written using asyncChecked and to infer the type of operations that can be run on any thread and preserve the thread (such as AsyncDownloadString). The Return operation creates an asynchronous workflow that immediately returns the given value. It doesn't interact with threads in any way - the workflow will finish on the same thread where it was started. The Bind operation is interesting. It takes a workflow of type CheckedAsync<'Pre, 'Interm, 'V1> as the first argument. In order to produce the result, it needs to evaluate this workflow first. This means that the computation will start on the 'Pre thread and end on the 'Interm thread. Then the operator calls the provided function and gets a workflow of type CheckedAsync<'Interm, 'Post, 'V2>. This workflow can be executed after the first one because the ending thread of the first one matches the starting thread of the second. After executing, the result will be reported on the thread 'Post, so the overall computation starts on 'Pre and ends on 'Post (which is reflected by the returned workflow type). The snippet also shows the type of While, which takes a function that is called to test whether a condition holds and the (asynchronous) body. When the loop executes the body repeatedly, the body must end at the same thread where it started. This directly follows from the type of Bind and the way Bind can be used to implement While. The typing rule for the For operation would be similar. Another interesting operation that is not discussed in detail in this article is TryWith, which represents an exception handler. This is quite tricky, because the exception will be handled on the thread where it happened, but that can be any thread where the body of the workflow can run! In the source code, I solved this problem by adding a new type named AnyThread, which is not compatible with any other type. For practical purposes, this is probably sufficient, but you can imagine several possible extensions. The AnyThread type could be a base type of both GuiThread and BackgroundThread making it possible to compose computations that end on a specific thread with a computation that starts on any (unknown) thread. We could also use even more complicated types in to track all possible threads that can be used by the body and then have types like AnyOf<GuiThread, BackgroundThread> representing any of the two. However, this doesn't add much practical value and it may be only interesting from a research perspective. Some of the ideas that I mentioned above have been actually done in different contexts. Although this is a blog post and not a research paper, the next section mentions several of the related academic papers (as well as some readable blog posts). If you're interested only in practical uses of checked asynchronous workflows, then you can safely skip it. The definition of a monad used in this article adds two type parameters to capture the required initial state (a pre-condition) and a resulting state (a post-condition). This idea is quite common when reasoning about programming languages and it can be traced back to Hoare logic . In Hoare logic, the pre- and post-conditions are not written as part of the progam - they are just a way of reasoning about existing programs. More recent work on "Hoare type theory" tries to embed this reasoning in the types of programs. More specifically, the signature of monadic operations that I used in the previous section is also called parameterized monad and has been studied from the theoretical perspective , but there is also a more readable introduction . It can be used for a variety of other things (besides threads in asynchronous workflows), such as tracking of acative file handles . In this article, I demonstrated an extension of F# asynchronous workflows that makes them safer. It adds a way to track where the workflow is executing - whether it is a GUI thread or a background thread. We can create computations that should be executed on the background thread using asyncOn background. These can safely perform long-running CPU-intensive computations and we know that this won't freeze the user-interface. Similarly, we can create workflows that can be only executed on the GUI thread using asyncOn gui. These computations can safely access user-interface elements. produces a value of type 'Value. computation that should not block the user-interface. access user interface and should run on GUI thread.